Nielsen has released highlights for its 360 Music Report of 2015. The company reviewed several elements of how the U.S. listens to music and how much money it puts into different parts of the industry. 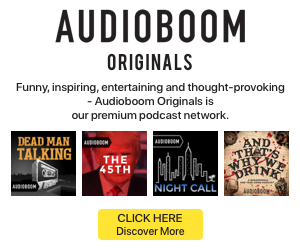 The data showed that 74% of Americans listen to music online in an average week, while 44% are listening to tunes on a smartphone in a week, both further reinforcing growth trends we’ve been seeing in both online and mobile audiences. One of the highlights of Nielsen reports are the breakdowns on music spending. For the total population, online music streaming services accounts for 7% of annual music spend, and 11% goes to digital tracks or albums. Physical formats account for 13% of total average spending. 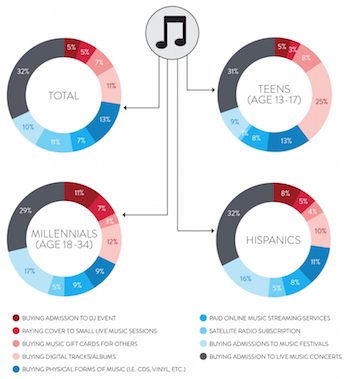 For millennials, online music streaming generated 9% of spend, while for both for teens and Hispanics, the rate was 8%. Of course, those percentages don’t account for any free paths to music. The next section puts the numbers for streaming platform spend into context. 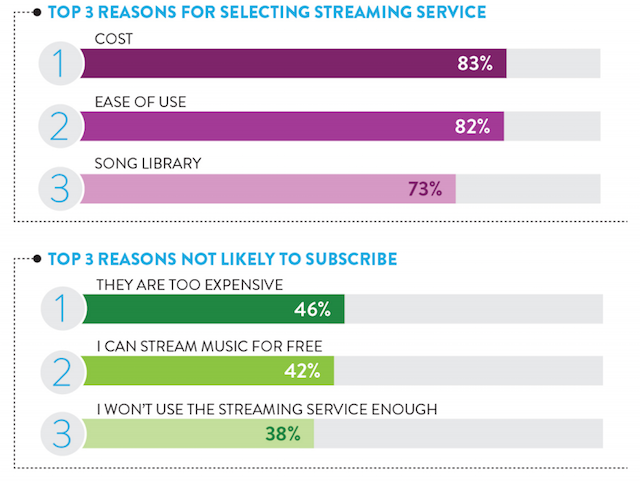 Cost was the top reason for listeners in selecting a streaming service, and it was part of the top two reasons for people to not subscribe: 46% said streaming was too expensive and 42% said they could stream free of charge. In fact, 78% of respondents said they are only somewhat likely or are very unlikely to pay for a streaming subscription in the next six months. These results make for an interesting comparison with another top source of data about music listening habits: the Infinite Dial study from Edison Research and Triton Digital. The 2015 report pointed to lean-back services as the top preference for listeners. Pandora had a huge audience advantage, with 45% of respondents currently ever using it. iHeartRadio had 17% and iTunes Radio had 16%. Spotify was the top on-demand platform with 13%. Considering all of those platforms are free or have free listening tiers, it’s less of a surprise that Nielsen found such a small slice of the pie going to paid subscriptions. For instance, Pandora announced that it exceeded 81 million monthly active users in its fourth-quarter earnings call, but less than $48 million of its $268 million in revenue came from paid subscribers. It’s a similar story at Spotify, which has inched up to 75 million listeners but only 20 million of them pay for access. Then there’s YouTube, which has been a popular music source but is facing all types of complications to its business as it hesitates on releasing a paid music platform. Music discovery is another central topic in the Nielsen studies, and this year’s report found that AM/FM and satellite radio was the top discovery engine, with 61% saying they found new music on the airwaves. The format actually grew its audience for this metric; last year it had a 57% rate for discovery. Word of mouth was a source for 45% of the general population, but held 65% among teenagers. 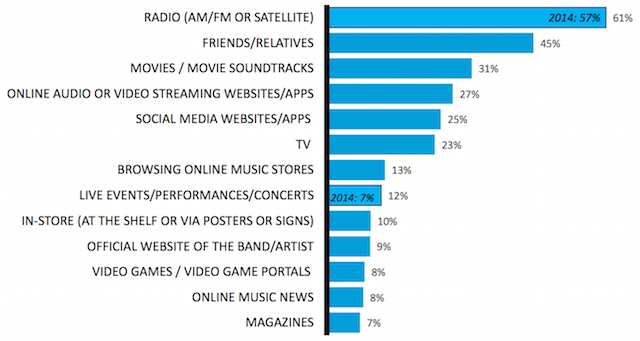 Audio and streaming was a discovery source for just 27% of the respondents. In contrast, Edison’s data showed strong performance for both radio and online sources in helping listeners explore new tunes. Among those who said it was very or somewhat important to keep up with new music, word of mouth just edged out AM/FM radio as the top source, with 70% and 69% response, respectively. However, another slide asked respondents which medium they used first to learn about new music. In that result, radio had just 32%, while the Internet secured 44%.